Some modern, high-end comfort with antique charm you'll want to go back to, after visits or shopping. One thing worth getting up for? The golden travertine spa bath. The spacious walk-in “emotional shower” features soothing color therapy and steam, leaving you refreshed and relaxed. You might brew a coffee from the in-room espresso machine and sip it while seated at the custom-designed glass-and-steel dining table. The apartment is in a strategic location, a stone throw from central train station, Duomo Cathedral and all attractions. There's an elevator that's not a common facility in the center of the city and the building itself is elegant and of historical and cultural value, residence of Ugo Foscolo's patron Candida Quirina Mocenni, Martelli's relative, in '700. A unique location between Santa Maria Novella, Cappelle Medicee, San Lorenzo Market and Duomo Cathedral. The area is full of restaurants, shops, supermarkets, and close to the incredible in-door market of San Lorenzo, the gastronomic mecca of the city. The bathroom completely covered in golden travertine, with a sink carved from a solid block of the same stone, offers a 'large walk-in shower with chrome-therapeutic Gessi emotional shower and turkish bath with color therapy and aromatherapy. I have stayed in Florence several times previously and always at a hotel. This time, thought we would try an apartment. Great choice. Pier is a great host and from the very beginning, communicates very proactively. Every question was answered in lightening speed. The apartment is large and well appointed. Separate bedroom, Lounge/Kitchen combined, timber floors, modern bathroom. Pier met us as soon as we stepped out of the taxi and helped us up with our luggage. He then spent time explaining every aspect of the apartment, WiFi, appliances, lightening, etc. 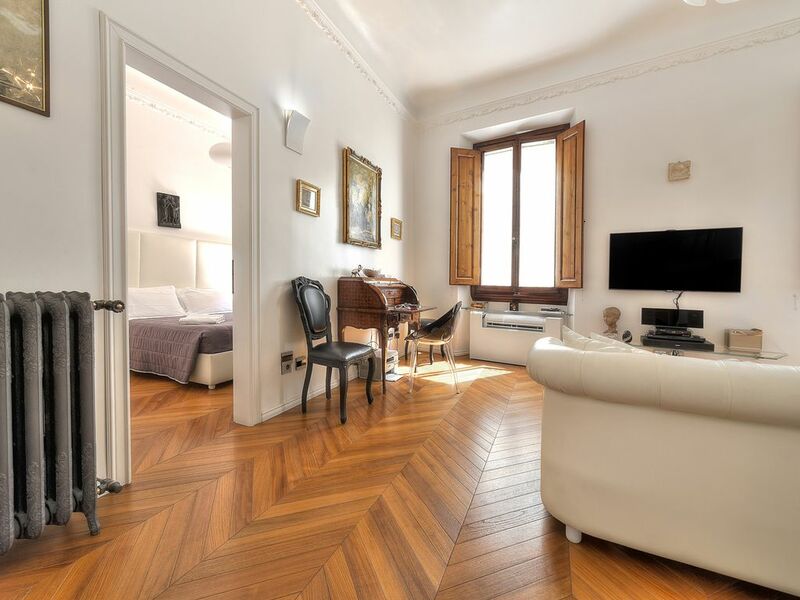 The apartment is fantastically located, a short walk from anything, just down the street from the train station, about 10 minutes to the Duomo, from there, everything is 5 - 10 minutes. In the immediate area are a host of restaurants. There is a supermarket right next door. Compared to a hotel, it is about 25% of of the cost and twice the size of the room. It is so nice to have access to basic cooking and clothes washing facilities. I would highly recommend this apartment to visitors to Florence. Great location, modern appartement with historic charm and the owner is wonderful! 1. Location. Within walking distance of everywhere. The Medici Chapels and Santa Maria Novella church are a block away. A good grocery store is just below you. It takes maybe 10 minutes to walk to the Duomo. The Central market is only 3 blocks away. 2. Modern apt. It was so nice to have a modern bathroom and kitchen! 3. Comfort of the bed. We have rented many apartments all over the world. The most common failing is the discomfort of the bed. This is not a problem. The apartment is listed as unfriendly to the disabled. But that is only true if you are confined to a wheelchair. I have a hard time walking distances or climbing stairs, but this apartment offered no problems to me. You need to be able to walk up 1 step to get into the hallway, 2 steps to get up the elevator, 1 step to get into the apartment lobby. One small step into the shower. There is a small lift. If you can handle 4 steps, you can stay at this apartment. We loved staying at this apartment when we were in Florence. It was very clean and well appointed. We were walking distance to all the sights we wanted to see. It was so nice to be able to come back in the afternoon and take a little nap before heading out again. There is also a nice grocery store next door which we found to be very handy. Piero was wonderful to work with—always answering emails or texts in a timely fashion. He met us at the train station, walked with us to the apartment, and explained everything about the apartment. I would definitely stay here again if we return to Florence. A great location coupled with a fabulous apartment. This was truly a bargain. 5 minutes from the Duomo, a really good grocery store downstairs, and a terrific location overall!. The apartment was decorated beautifully, the kitchen was really nice, and the bedroom was even nicer. Lots of storage and a super comfy bed. Toiletries and the other amenities were great. Even goodies in the fridge including eggs, juice, etc. The bathroom was as nice as you will find in a resort. Let's not forget the wonderful combination washer/dryer which worked perfectly. Right in the center of the center of Florence.